Tablets have introduced a number of great features that are currently without equal in the notebook space. 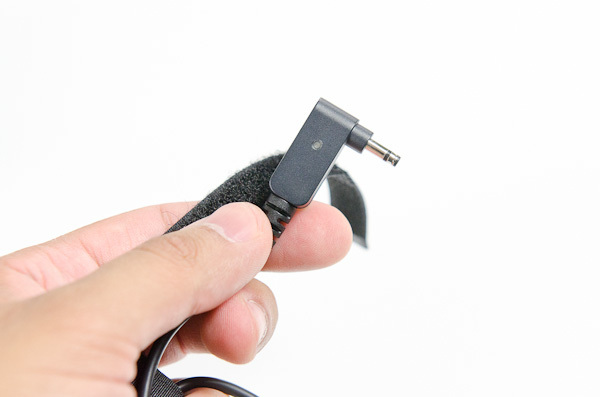 They are ultra light, extremely responsive, have tremendous battery life and are generally instant-on devices. Tablets however, aren't that great for being productive on, leaving good reason to still carry around a notebook. As both platforms continue to grow you'll see them learn from one another. Updates to the tablet experience in iOS 5 for example are clearly built around improving productivity. What about the notebook PC though? What is being done there to make it more tablet-like? 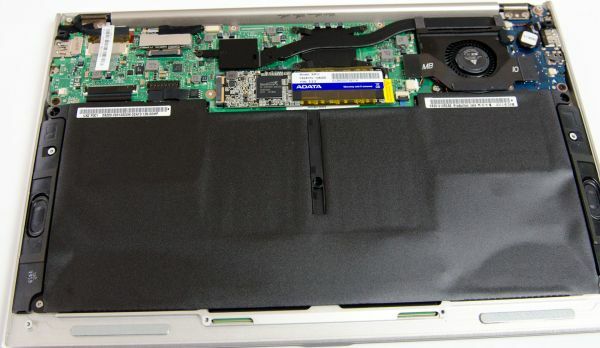 This is where Intel's Ultrabook category of notebook PCs comes into play. Ultrabooks today are simply ultra portable notebooks with a few requirements. They need to be thin, light, have a fast CPU (Sandy Bridge will do for now) and use some form of solid state storage. The SSD requirement helps OEMs guarantee that these Ultrabooks will have reasonable response time (application, boot and wake). Despite the tablet comparison, Ultrabooks aren't intended to go up against ARM based tablets. Intel will eventually have an Atom powered answer in that space, although we likely won't see it until Windows 8 ships. Hardware specs alone aren't enough to bridge the tablet gap, which is why Intel views new features through software as a major part of the Ultrabook play. Intel expects Ultrabooks won't really go mainstream until sometime in late 2012-2013, so this first wave of notebooks are really nothing more than ultraportable PCs. If you look close enough, they may even look like MacBook Air clones. 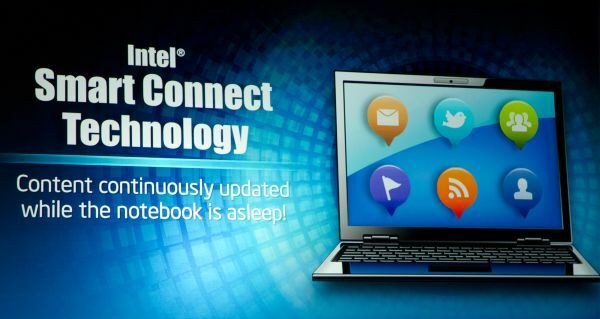 With the Ivy Bridge and Haswell updates, Intel is expecting to expand the impact of what Ultrabooks mean but today they are pretty much well designed notebooks with a fancy name. 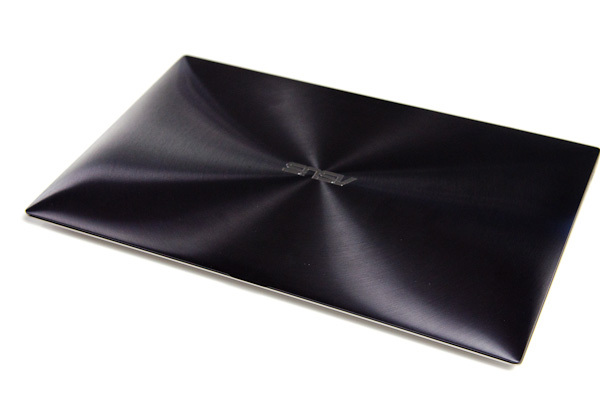 The Zenbook is built out of an all-aluminum chassis. ASUS starts with a block of aluminum and uses a CNC mill to carve out the chassis. The resulting chassis is extremely rigid and devoid of all perceivable flex. The only removable panel on the Zenbook is underneath the chassis, limiting the user's interaction with non-keyboard components that aren't built out of a single piece of metal. The main chassis has a vertically brushed pattern on it while a circular brushing pattern is used on the display lid. 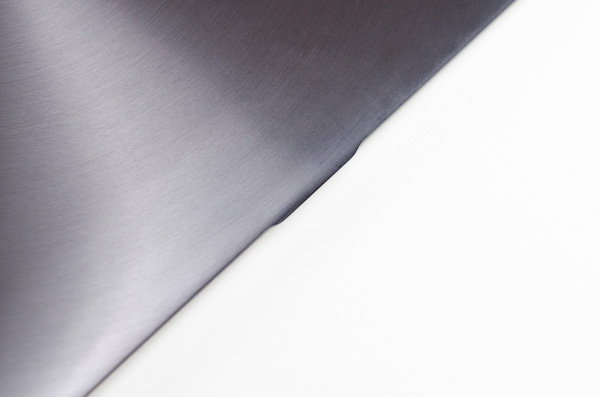 the two parts of the Zenbook are also colored differently, with the main body featuring a platinum silver while the display uses a darker steel color. 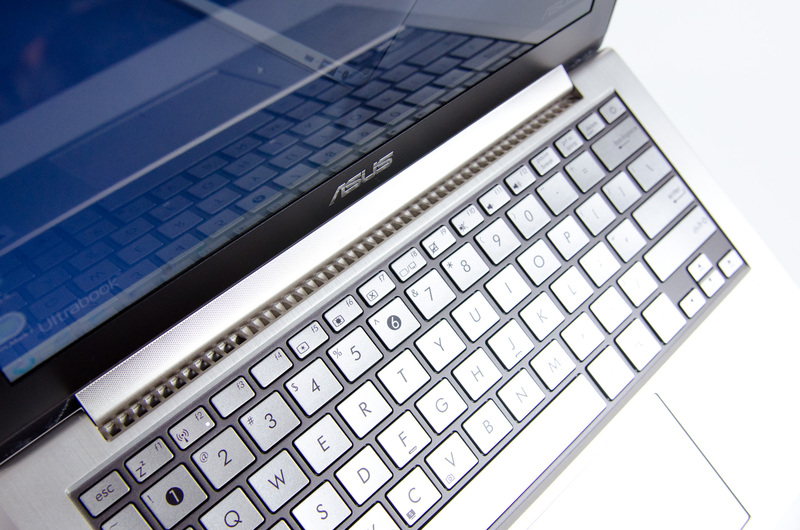 In a nod to just how design focused ASUS was with the Zenbook, even the 10 screws on the bottom of the chassis feature the same brushed pattern as the rest of the chassis. ASUS elected to use torx bits instead of standard phillips heads to better match the industrial design of the system. While I appreciate the attention to detail I think I'd be happier if ASUS had stuck to standard screws. The effect is both elegant and functional. In using and benchmarking the system I definitely heard the fans spin up, but the chassis never got uncomfortably warm—even when looping Cinebench while typing this paragraph. Part of that is due to Intel's low voltage Sandy Bridge CPU, but part of it is because ASUS' design isn't embarassed to admit it needs air to cool the CPU. The UX21's two speakers point downward and together produce a surprisingly decent sound. It's better than the 11-inch MacBook Air for sure. 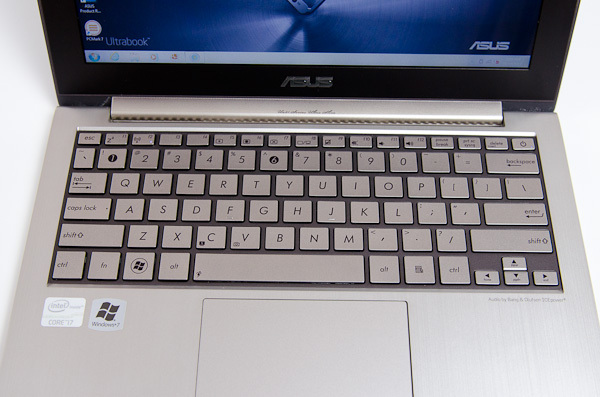 ASUS includes a small lip on the display cover to aid in actually getting the machine open. Lifting the lid on any of these ultra slim machines isn't easy (as you're liable to lift the entire laptop instead of just the lid) but the lip does help a bit. The display hinge is reasonably stiff. I'm able to hold the Zenbook up with the display perpendicular to the ground and not have the hinge give under the force of gravity. Picking up the Zenbook and shaking it a bit will allow the hinge to move as you'd expect, but overall it seems pretty resistent to unintended motion. ASUS printed a pattern of very tiny hexagons on the surface of the hinge, giving the impression of perforation. On my sample one of those printed hexagons appeared slightly out of place, which in turn made it looked like my Zenbook had a clogged pore on its hinge. If you're the OCD type you better hope yours turns out perfectly. 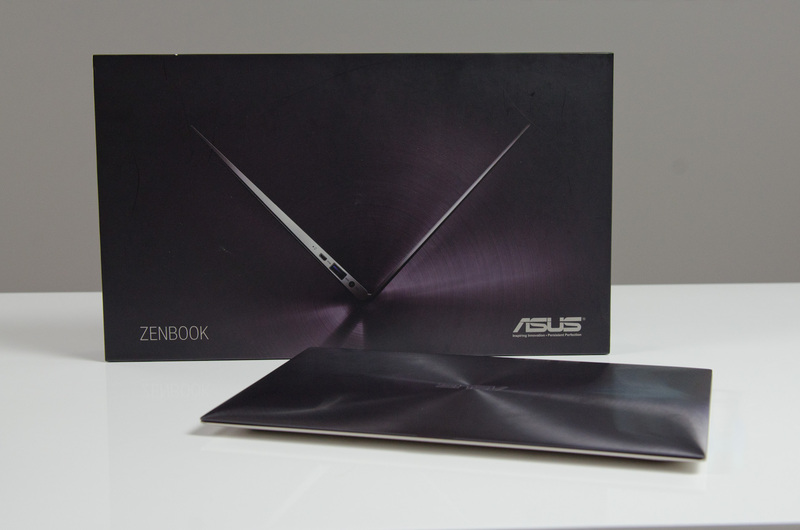 With that minor exception I have to really commend ASUS on a job well done with the Zenbook's design. It's easily the most beautiful PC notebook I've ever laid hands (and eyes) on and even stands out more than a MacBook Air thanks to its brushed aluminum surface. Apple's design does look a bit more cohesive in my eyes, while the ASUS' Zenbook is more on the tastefully flashy side. Either way it's absolutely gorgeous and one of those things you just have to see to appreciate. I haven't been able to take a photo of the Zenbook that I believe adequately captures just how good this thing looks. The design is quite functional as well. 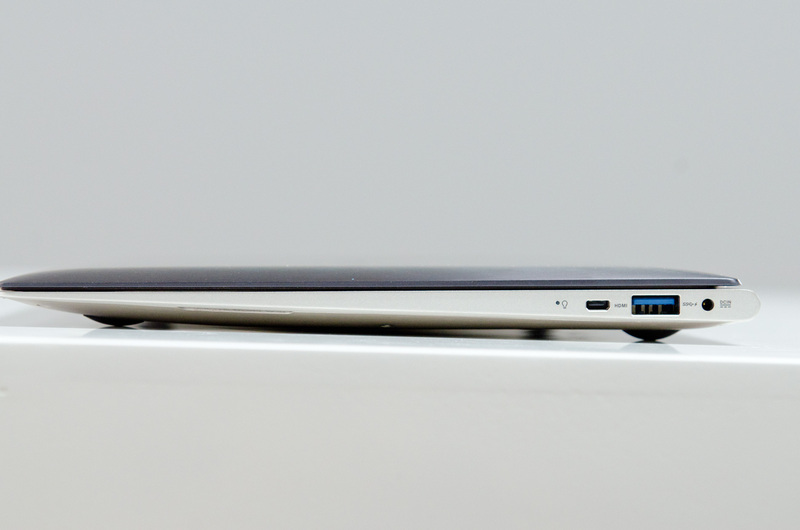 Thanks to the slim profile of the Zenbook and its diminutive weight, the UX21 is an absolute pleasure to carry. It's the pinnacle of portability without sacrificing the functionality of a keyboard. A tablet sure is nicer to carry, but the UX21 is much easier to type on. The entire design is a bit more curvy than the current MacBook Air but it feels great in your hands. If you're used to Apple's aluminum the Zenbook may feel a bit tougher but the edge is something you get used to over time. After a few days of using it, the Zenbook UX21 felt just as comfortable to me as the MacBook Air. I'm personally a fan of the 11-inch form factor as I believe, with Sandy Bridge, it delivers a great balance of portability and performance. If you do a lot of writing, it's a great companion. The Zenbook UX21 features two USB ports: one 2.0 port driven off of the QS67 chipset and one USB 3.0 port powered by a Fresco Logic FL1009 controller. Why not feature two USB 3.0 ports? 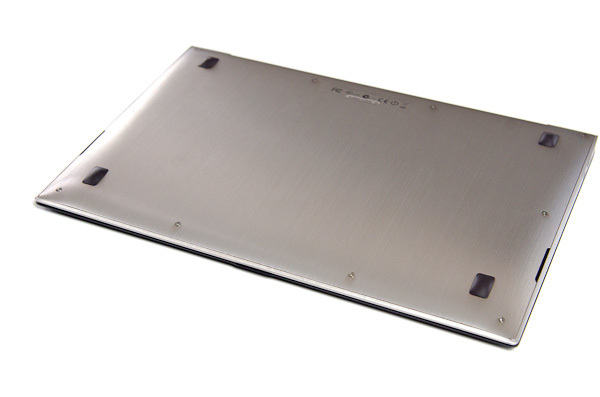 The Fresco Logic controller supports two ports but the 11-inch chassis required that one port be allocated per side. The USB 2.0 port actually resides on a daughterboard on the other side of the system from the USB 3.0 controller. It looks like there wasn't a clean way to route the traces from the FL controller to that side of the system, which is why you get 1 x USB 2.0 and 1 x 3.0 port. The performance advantage of USB 3.0 is beyond obvious. I measured large file transfer rate across both ports and saw the following results: 149MB/s on USB 3.0, 26MB/s on USB 2.0 port. After being stuck in a number of situations where I was forced to copy files via USB stick, I definitely appreciate systems that come with USB 3.0 support. The Zenbook unfortunately doesn't ship with a backlit keyboard. I asked ASUS why it opted not to include one, worrying that the decision was somehow price-related. It turns out it was simply a time to market issue. Designing anything this slim is difficult and ASUS needed extra time to build a keyboard lighting system that would work in the Zenbook's chassis. In the interest of getting product out the door in early Q4, ASUS abandoned the idea of doing a backlit keyboard this generation. It's quite possible we'll see one next round with Ivy Bridge. 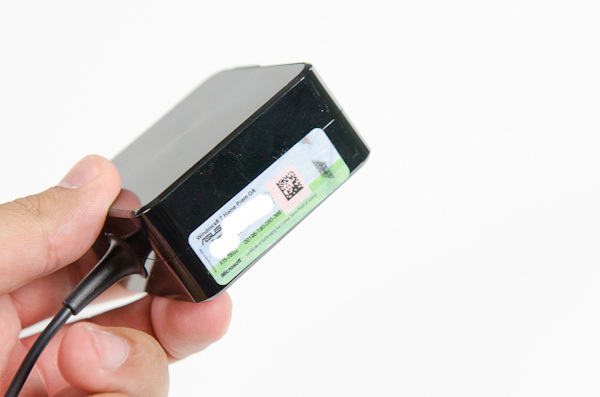 The SD card reader would have to either occupy the area of one of the USB ports, or take out a chunk of area reserved for the integrated battery. Neither sacrifice seemed to make sense to ASUS and as a result the 11 doesn't include an SD card reader. While I can't quite pinpoint ASUS' source of inspiration for the Zenbook UX21's 45W power brick design, the end product looks great. Cable management is handled via a standard velcro strap and the power connector itself has an LED on it that glows orange when charging or green when fully charged. Unfortunately It also glows green when it's not connected, which can cause confusion if you plug it in but don't push the connector in all the way. Is it fully charged or just not fully connected? Guessing is half the fun! In our earlier coverage I pointed out that ASUS had moved Microsoft's required Certificate of Authenticity to the power brick, something that's usually located on the system itself. 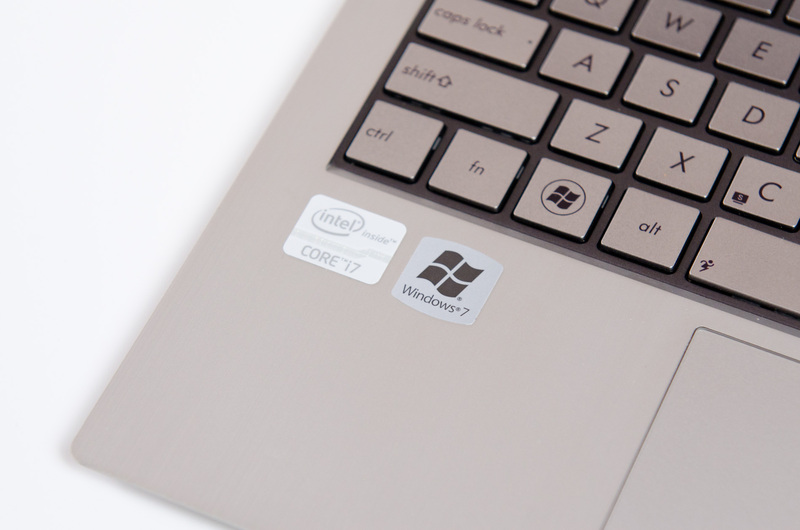 Microsoft mandates the sticker's placement on the system, however there is a clean PC program an OEM can apply for in order to somewhat skirt the requirement. 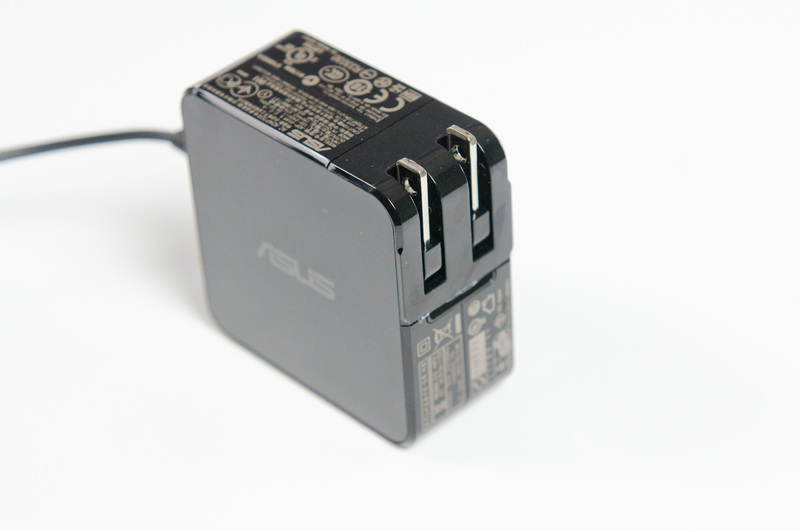 ASUS did apply for and was approved, allowing it the luxury of moving that CoA sticker to the power adapter. While it does improve the beauty of the machine, it also means that if you lose your power adapter you do lose your CoA. Microsoft and Intel were also petitioned to allow greyscale versions of their respective product logos. ASUS' request was also approved, which is why you see less obnoxious Intel inside and Windows 7 stickers on the Zenbook. At Computex earlier this year Intel announced two technologies that would be featured in some Ultrabooks starting this year: Rapid Start and Smart Connect. Rapid Start sounds a lot like hibernate to NAND, promising 6 second start times from a very low power state. You can get even quicker start times from suspend to RAM, but you sacrifice standby battery life as you have to keep refreshing data stored in DRAM while your system is asleep. Rapid Start gets around this issue by apparently storing some, but not all, data in DRAM—reducing the burden on the battery while asleep, and reducing the amount of data that needs to be read off the SSD upon wakeup. ASUS felt that even a 6 second start time was too long and instead went after reducing STR power consumption. The result is a sub 2 second wake time (from sleep, not full off) and a ~9 day standby time on a full charge. ASUS wouldn't detail exactly how it managed to increase STR battery life, just that it spent a lot of time studying what electrical components could be shut down to save power and implements a bunch of its own tricks that its competitors haven't seemed to figure out. The Apple comparison is inevitable as the MacBook Air is rated for much longer standby time; presumably the advantage there is largely OS X related. Intel's Smart Connect Technology is another Ultrabook feature that isn't present on the Zenbook. The idea behind this one is to have a layer of software that would periodically wake your system up while asleep and fetch all new updates (e.g. Twitter, Facebook, Emails). With Smart Connect enabled, when you actually do wake up your machine it should be far more up-to-date than it would've been normally. In order to enable Smart Connect you need Intel's WiFi solution. ASUS chose an Atheros WiFi card and as a result there's no Smart Connect here. 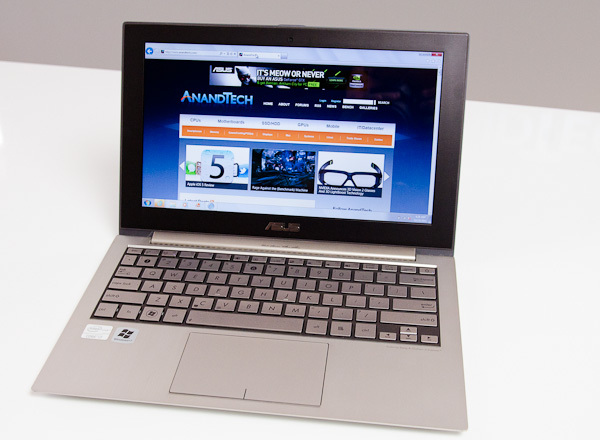 All Zenbooks ship with ASUS' PowerWiz Windows Gadget that gives you some battery life estimates. Based on internal ASUS test data and the current amount of battery remaining, the tool estimates how long your battery will last for various workloads. This data is all static in the sense that it is based on predetermined values and not your current workload. The standby battery life estimate however is a bit more accurate. 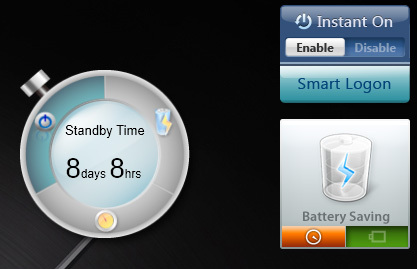 Every time you put your Zenbook to sleep, ASUS monitors power usage for a full minute. Based on that power usage it then determines standby time given remaining battery capacity. Since standby power depends in part on what you have in memory, this method of estimation can significantly improve accuracy. Granted you'll always get a trailing estimate (e.g. this is how long your battery would last in stand by if you're doing exactly what you did last time you put it to sleep) but it's better than nothing I suppose. On the battery life performance you have the Zenbook down as being an i5 - presumably that's a typo and was meant to be an i7? Or did you do the battery test on the i5 model? In which case the model number is presumably a typo? Now you are releasing 1600x900 thin laptops? GTH. I'm not sure that would meet N specs, though. You're saying it would operate w/ N, but it would be on a 2.4GHz band, which would more than likely limit the throughput.